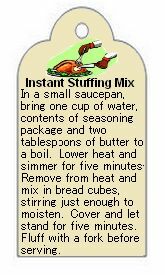 This instant stuffing mix is so tasty, it’s sure to be a hit gift for friends and family. You’ll also want to keep some stocked up for yourself – this is a money saving recipe as well! 3 to 3-1/2 cups of bread cubes (to fit a quart jar with space for seasoning package) (These can be purchased bread cubes – although I save dry white and whole wheat bread slices in the freezer until ready to use. When needed break the bread slices into small bite size portions and use as you would purchased bread cubes). Put bread cubes in a one quart jar, allowing room to add the seasoning bag on the top of the jar. In a small plastic bag, combine all seasonings and mix well. Seal bag with twist tie or ziplock and place on top of the bread cubes. Follow instructions on the printable labels at right. If you wish, print either of the two gift labels, cut out, then glue or tie onto the front of your jar. Decorate the jar lid with a paper doily fastened with thin gold braid, as shown, or top with a circle of seasonal fabric tied with ribbon. Are the bread cubes dried or toasted? They are dried. I have dried bread cubes in the oven, at the lowest temperature, turning them frequently until dry, but you shouldn’t leave them in to the point of toasting.